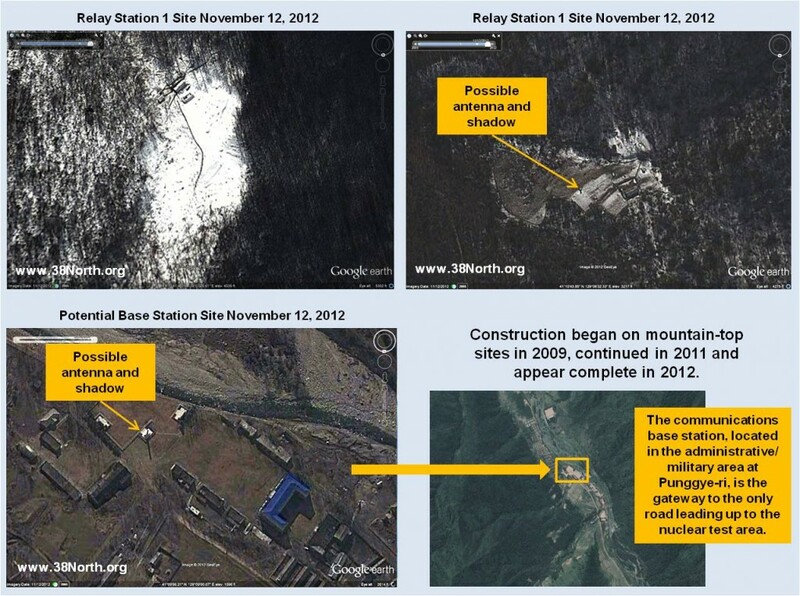 Based on recent satellite imagery of the Punggye-ri Nuclear Test Facility, 38 North has identified installations that may play a critical role in the conduct of a North Korean nuclear detonation. One facility is a command and control bunker located approximately 150 meters from the possible test tunnel entrance that, in addition to providing shelter for all personnel in the area, could contain equipment for controlling the nuclear device, managing instruments for monitoring test data and communicating with higher authorities. In addition, a Russian radio relay system appears to be nearby and may be part of a communications system with Pyongyang. The nuclear device and its trigger are moved from storage and assembled in the tunnel chamber. If stored offsite, this could take a week; if onsite, a day or so. The trigger initiation assembly and wiring are connected, checked, double checked and set in a safe mode, a process likely to take one to two days. The device will then be ready. At the same time, test site personnel will: 1) check and calibrate sensors in the device chamber and tunnel that will provide critical data over cables attached to recording equipment near the tunnel entrance on whether the device worked as planned; 2) check and calibrate sensors in the bunker area; and 3) check command and control consoles and communications equipment in the bunker for connectivity to the nuclear device trigger, proper monitoring of the sensors assigned to the test and secure communications with Pyongyang. After preparations are successfully completed, the site commander communicates to Pyongyang that he is ready. Sometime after, the capitol transmits an order via secure communications channels to the commander to be prepared to conduct the test on a specified day. Just hours before the test, the site commander orders a final status check on the readiness of the nuclear device and the calibration of the sensors as well as on favorability of weather conditions. He then sends an advisory message to Pyongyang. The final order to proceed may arrive in as little as an hour. All personnel then go to the command bunker and the site commander orders the countdown to begin. During the countdown, the chief engineer goes through the system readiness checklist. If there are no problems, a test ready state is declared at one minute before detonation. The site commander detonates the device, perhaps by inserting and turning a key in his console in the command bunker. Depending on North Korean procedures to prevent an unauthorized detonation, he may be preceded by another officer who follows the same procedure. Construction of this bunker appears to have begun after 2005. By 2009, excavation and construction activities were underway including three worker buses at the location (see figure 2). By April 2012, the bunker entrance is well defined; its shadow indicates that the entrance is set down and away from the tunnel entrance for protection against an unanticipated blast. Additional construction on top of the bunker area could be for a ventilation system or a large piece of monitoring equipment such as a seismometer or air quality station. While visible excavation scars indicate that the bunker could be at least 1,000 square feet in size, if that construction is an air vent, it could extend underground at least 50 meters from the entrance instead of the 10 meters that is the basis for the above estimate. 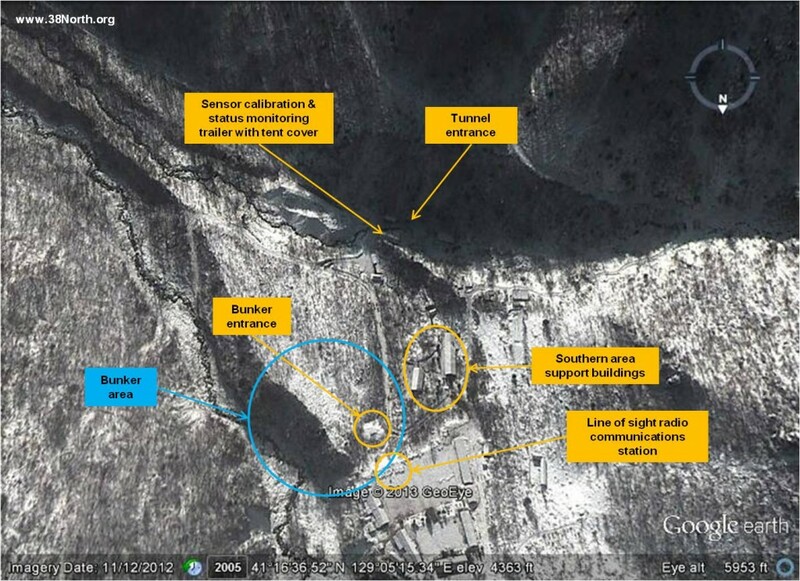 The size of the bunker may be even larger if there is additional unidentified tunneling. Note: South is up on all three images. Instruments for Monitoring Test Data? A peculiar 4 meter by 4 meter square object visible in November 2012 imagery near or on the area of construction on top of the bunker area could be an air vent or, alternatively, might house some special instruments. A photo from December 2012 shows footpaths leading to possible instrumentation sites along the east side and the square object. There is also a cluster of objects on the west side that may be instrumentation and can be accessed from the road. The well-defined footpaths indicate that these sites are visited often. There are also objects or vehicles at the entrance to the bunker over which a tent canopy was erected in December for protection against the weather. Analysis of recent imagery reveals a communications system probably linking the bunker to higher command authorities (see figure 4). Since the order to detonate a nuclear device will be issued by North Korean leadership, reliable communication with Pyongyang is essential. Secure landline communications—either copper or fiber optic cables strung the distance to the test facility—may have been established. Since storms, such as those in the summer and fall of 2012, or technical problems might disrupt those lines, an alternative system would be required to maintain reliable communications. The network—with a signature of three trucks parked in parallel and dish antennas on top of a mast—appears to be a Russian R404 or R414 radio relay system. While the R404 radio relay system has been in widespread use in the former Soviet bloc countries for decades, the R414 is a newer, more capable model. One truck carries the antenna and mast; the second supplies power; and the third contains the communications equipment. Note that the communications system is set up near the entrance to the command bunker to support its operations. In practice, the radio relay system would support mostly command and control operations since its data transfer capability is limited relative to the amount of data required to monitor a test. Photos: (left) twower.livejournal.com; (right) http://militaryforces.ru/weapon-4-83-550.html. The radio relay path must zigzag down the valley to avoid blockage by the mountains. In order to complete the path to a base station that appears to be ten miles away, two mountain-top radio repeater stations are required as well as three line of sight legs. 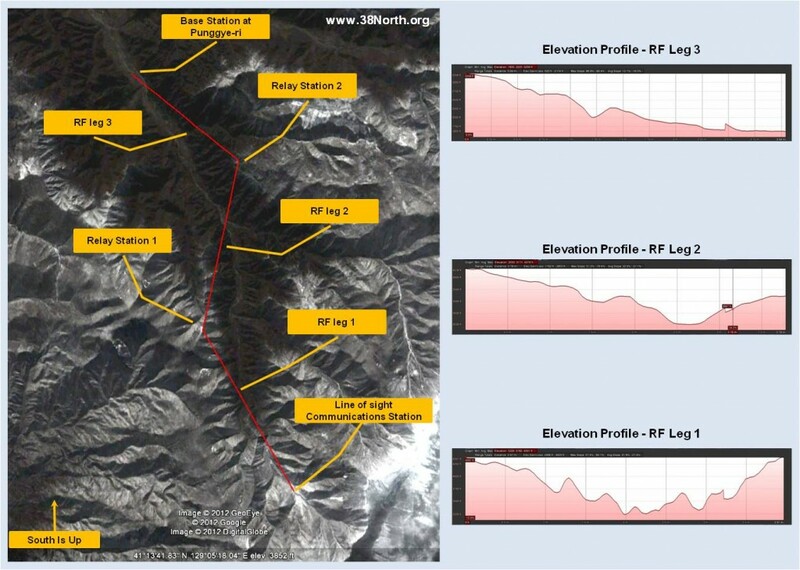 Figure 5 shows the locations of those cleared mountain tops and installations. The elevation profiles for each of the legs allow clear line of sight paths between each node of the radio relay path. Graphs created by 38 North. Construction began on the mountain-top sites in 2009 and appears to have been completed by 2012. The possible base station, located at Punggye-ri in an administrative/military area at the gateway to the only road leading to the nuclear test area, would contain equipment for completing the communications link with Pyongyang (see figure 6). After the Test Order is Given, Then What? This assumes North Korean nuclear devices are equipped with technology—perhaps rudimentary—to prevent unauthorized detonation. American nuclear weapons were not equipped with Permissive Action Links (PAL)—three number combination locks—until the early 1960s and the technology has become progressively more sophisticated since then. Weather conditions may affect a final decision to go forward with a test. For example, prevailing winds, whether they are blowing towards or away from populated areas, could be an important consideration.